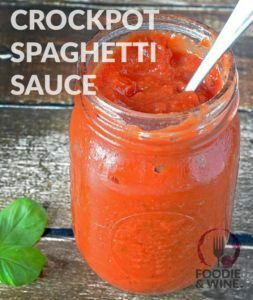 This homemade spaghetti sauce recipe is our new favorite here at FoodieandWine. 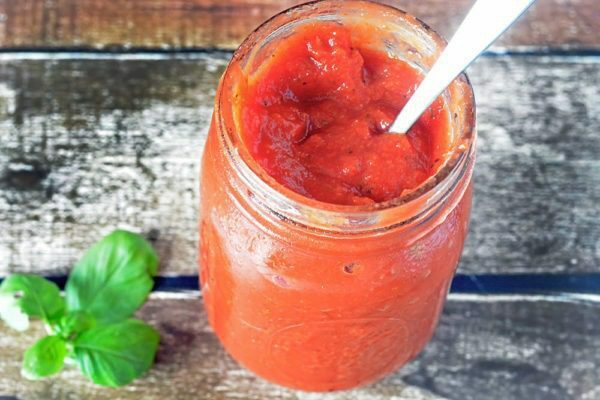 Since we’ve been making grilled pizzas like crazy this summer its been doubling as our pizza sauce recipe also! For the last month we’ve been making batches as we needed them, but realized it would be easier and more cost efficient to make it in large batches and freeze what we weren’t using that day. Downside? We had to clean out the FoodieandWine test kitchen freezer to make room for the homemade spaghetti sauce. Lame. If you’re looking for a simple spaghetti sauce recipe, this is it. Feel free to use your stovetop if you’re not a Crockpot Recipes kind of cook. Dump everything into a crockpot (or medium size pan if you're using the stove) and stir until fully combined. Cook on low for 4 hours, stirring occasionally. If you're using the stovetop method, bring the mixture to a boil and then turn the heat down to low and cover the pot. Let cook for 20 minutes, stirring occasionally. Taste Test - add additional seasonings to get the exact taste you like (We heavy up on the garlic).